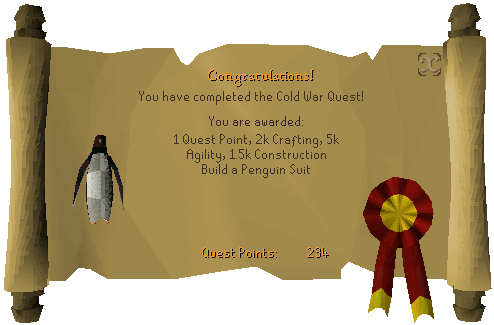 If you are looking for the modern RuneScape guide for this content, please see our Cold War guide. 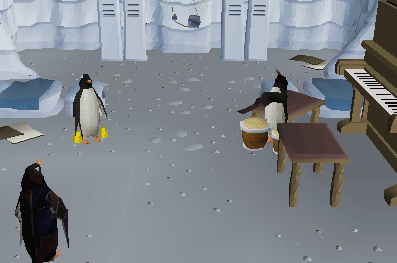 At the Ardougne Zoo, one of the zookeepers has become a bit preoccupied by penguins. In fact, he's downright paranoid about them. He needs your help to observe their habits on the iceberg in the Lunar Sea. 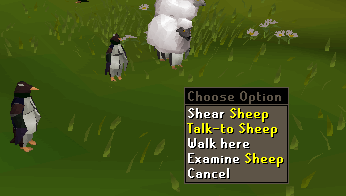 Begin by speaking to Larry at the Ardougne Zoo. 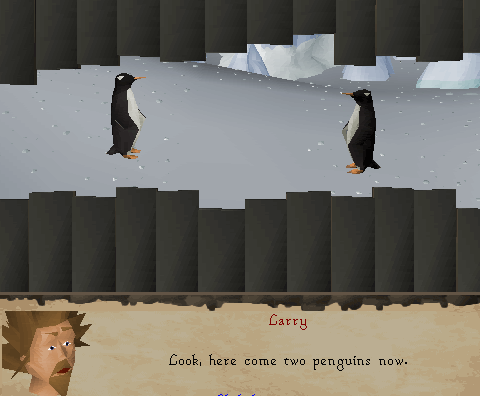 Start by speaking to Larry at Ardougne Zoo, near the penguins. He will tell you about his fascination with penguins and his study of them. He will ask you to help him. You will need to bring 10 oak planks, 10 steel nails, a hammer and a spade. While you are gathering supplies, Larry will provide transportation to the location. You will then meet him at a dock north-east of the entrance to Keldagrim. Again converse with Larry and you will take the boat to.... an Iceberg. Once there, again, talk to Larry and he will tell you how to build a bird observatory. Be sure to have the materials in your inventory. You will start the build by using an oak plank on the snow patch. After the initial build is done use your spade to cover it with snow, to blend it into its surroundings. WATCH CAREFULLY: You will need the emotes shown by the penguins later on. Write the movement of the penguins down on a piece of paper, even though Larry said he would include it into his research, he won't. Again speak with Larry, he will relate a story of a disguise you will need, to mingle among the penguins: An automated penguin suit. He will also relate a piece of disturbing news: You will need to be shrunk. He will hand you a book with the building instruction on how to make this disguise. Gather your silk, steel bar/clockwork mechanism and plank, and head over to your house and work bench to make the penguin suit. The penguin suit is made at your crafting table (needs to be upgraded to table 3, 34 construction needed). Once done, return to the dock and speak with Larry. You will again travel to the iceberg and upon arriving your carefully constructed contraption has been demolished. 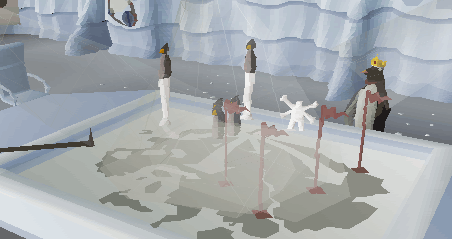 Disappointment sets in, but your quick mind thinks of a way to test the penguin suit: At Ardougne Zoo. Larry will be so kind to teleport you both over there and it is time to suit up. When dressed-up as a penguin you try to talk to your look-a-like. He indeed will speak with you but you then will need the proper greeting: 3 consecutive emotes, as were there when you observed the penguins on the iceberg. Should you have forgotten these it is a trial and error thing. The greetings are different for each player. After getting the greeting right you will be told the reason why the penguins are undercover: They want to learn how to fly! You will be given a Mission Report and are told to visit the operatives at Lumbridge. 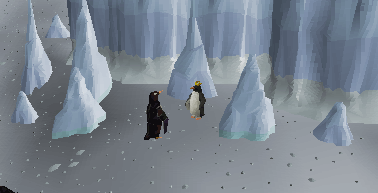 Head over to Lumbridge and like so often in this quest speak with Tuxedo time Larry, which is a short-cut to equip the penguin suit. Find the disguised penguins and talk to them, and you will find they are not inclined to engage in a meaningful conversation: You will need a code before they will oblige. Again you will need to go back to Ardougne and speak with the penguin to obtain a the code-phrase: "Don't trust the walrus". 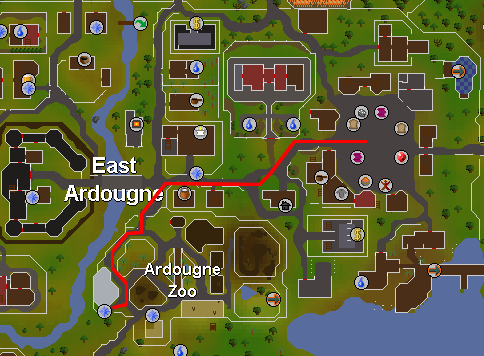 Going back to Ardougne this time doesn't take much time: Talk to Larry and he will teleport you there. Suit up again as penguin and enter the cage. Seek out the Cod Addicted Penguin and bribe him with your Cod, alternatively you can use your Ring of Charos (a). He will then reveal the code-phrase: Don't trust the Walrus. 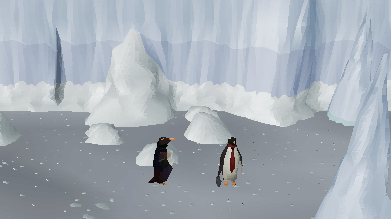 Again back to Lumbridge, speaking to Tuxedo time Larry and, again, find the sheep-dressed penguins. Go through the whole conversation and they will tell you to investigate the resident farmer. It seems these hardened penguins have chosen the wrong spot to spy on human kind by the way, and what is more: They realize this. Head over to Fred and use either option in the conversation. Back again to the 'dressed-as-sheep-waiters' and again a conversation.... And after some, more or less, inspiring conversation, the location of the entrance to the secret base is revealed. What is even more important: The secret password to enter is given to you as well. Most of what will be described below has a reference to the iceberg area. Should you get lost the map below could help you find your bearings. The Mission Reports now are building up in your inventory, and it is about time to get rid of them. Back to Larry again to inform him what you have found out and then back to the iceberg: Time to tackle the enemy in his lair. Once again, make your way to the iceberg, you should have that routine down pat, by now. Speak to Tuxedo time Larry, and make your way north-west until you see a waiter with tie, a member of the KGP. You are told to present your ID and, alas, you don't have one. Don't despair, even among the penguins, black markets seem to flourish. Walk a bit south-east and you will come across a shady character called Noodle who will, for the right reward, 5 feathers and a Swamp Tar, provide you with the two items you need most: Your ID and your own Mission Report. Back to the KGP agent who will now let you enter the doorway, hidden under the avalanche. You are told to report to de-briefing in the first room on your left. Yet another KGP agent to report to and you will hand over all mission reports. And then sent on an agility course. Head for the door at the end of the room and you are faced with a few obstacles that can hit you hard at lower agility levels. Ranging from icy water, falling icicles and traversing slippery ice, once you reach the end of it you are home free, for now that is. With a final good-bye from the instructor you now can roam freely through the inside of the iceberg. Sadly, most of the doors are locked and it is time to report back to Larry. His advise is to seek out a secret room deep inside the glacier. And thus, off you go again. Time to find Ping and Pong, not the video game, but two penguins that sound as if they are teleported in from the 70's. You can find them in the first big room on your right after entering the glacier. Of course you need to find another few items: Bongos and a Cow bell. After they told you what they wanted of course you again are at a loss and....... report back to Larry. Once again he amazes all with his insight and tells you how to acquire the objects. And you realize this is the time to try and open the big doors. Go outside, walk north toward the big doors and in the booth to your left you will find the controls that open the door. Once inside turn right and at the end you will find the War Room. Entering the room you will find Pescaling Pax revealing his plans. But, alas, you will also be caught and thrown into a cage with some level 51 Ice Lords. Make your way to the door, which quite surprisingly is not locked, and at the other side there is a chasm that you can crawl through. Make your way back to Larry and speak with him. 5,000 Agility experience. 2,000 Crafting experience. 1,500 Construction experience. Ability to build a penguin suit. Access to the Agility Course, level 30 Agility needed. The eight different penguin emotes are only available when wearing the complete penguin costume. 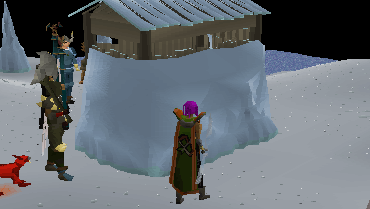 This costume can only be worn in the vicinity of Larry, either at Lumbridge sheep pen, Ardougne Zoo, Rellekka dock or on the Iceberg.